Luke 10 by Dr. Bill Sones, Jr.
"What is the Christmas Spirit?" "4 Titles Given Christ in Matthew"
"3 Titles Given Christ in Revelation"
"What Does It Mean to be in Christ"
Luke 9 by Bill Sones, Jr. Lesson 2, "Blessing of Eternal Salvation"
Lesson 5, "Promise of Assurance, Love, & Joy"
Lesson 8, "Doctrine of Election"
Lesson 9, "Why the World Hates Christianity, Part 1"
Lesson 10, "Why the World Hates Christianity, Part 2"
Introduction: "Women of the Word"
"Living to the Glory of God"
"Glorify God by Praisng Him"
Lesson 1, "The Mysterious Jesus"
Lesson 2, "The Miraculous Jesus"
"How Does A Person Get Saved?" "One Great Task, Part 1"
"One Great Task, Part 2"
"How Do I Respond to the Word of God"
"The Test of the Tongue"
"The Test of Are You a Friend of the World?" "Test of How A Person Handles His Wealth"
"A Person's Patience in Trials"
Lesson 1, "The Man Daniel"
Lesson 2, "How Do We Not Be Anxious"
Lesson 4, Daniel 9, "A Prayer & An Answer"
Lesson 5, Daniel 9, "Daniel's Prayer, Part 2"
Lesson 6, Daniel 9, "Daniel's Prayer, Part 3"
Lesson 7, Daniel 9, "Daniel's Prayer, Part 4"
Lesson 8, Daniel 9, "Daniel's Prayer, Part 5"
Lesson 9, "Daniel 7. Part 1"
Lesson 10, "Daniel 7, Part 2"
While Jesus was on the Cross"
"Matthew's Account of The Resurrection"
"How to Be Great in the Kingdom of God"
"How to the Know the Will of God"
"I am the Way, the Truth & the Light"
"What Should Our Response Be to Our Salvation"
Lesson 1, "Our God Breathed Bible"
Lesson 2, "How to Know the Bible"
His Character & His Attributes"
Lesson 4, "The Person of Jesus Christ"
Lesson 5, "The Work of Christ"
"The Person & Ministry of the Holy Spirit"
Lesson 8, "Prayer & the Believer"
Lesson 9, "The Body of Christ"
Lesson 12, Love & Obedience"
Lesson 3, "Living Lives that Glorify God"
Lesson 4, "Principles for Spiritual Growth"
"Lesson 5, Living Lives to the Glory of God"
Principles for Living the Christian Life"
"Boldness in Prayer, Part 1"
"Boldness in Prayer, Part 2"
Lesson 2 - The People Who Missed Christmas"
Lesson 3 - "Why Jesus Came"
Lesson 4 - "The Wise Men"
"CREATION- Believe It or Not"
6 For God, who said, “Let light shine out of darkness,” has shone in our hearts to give us the light of the knowledge of God’s glory in the face of Jesus the Messiah. 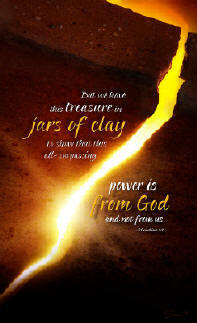 7 But we have this treasure in clay jars to show that its extraordinary power comes from God and not from us. 8 In every way we’re troubled but not crushed, frustrated but not in despair, 9 persecuted but not abandoned, struck down but not destroyed. by Dr. Bill Sones, Jr.
An 11 week study: "The Word Became Flesh"
"Overview of Romans 9, 10, & 11"
Ezekiel does not allow an audio over 60 minutes. Awesome lesson, be sure to listen to both parts!! "The Gospel in a Nutshell"
V's 8-16a: "Paul Shares His Heart"
V's 16-17: "Paul's Theme & Thesis for the Epistle"
"The Wrath of God" by Dr. Bill Sones, Jr.
"Has God Revealed Himself to All Men? Religious, Yes...but are you Righteous? How Can You Tell if You are Really Saved? Can the Law Save You? "The Glory of the New Covenant"
"The Message of the Ministry"
"The Conduct of the Ministry"
"Doing the Lord's Work in the Lord's Way"
"The Test of Trials - James 1:2-12"
"How Do You Respond to Temptation"
"How Do You React to the Word of God"
"Living Faith vs. Dead Faith"
"Living Your Life According to the Will of God"
Evangelism of the Unsaved in the Church"
"The Distinguishing Marks of Genuine Christians"
Lesson 2, "Motives in Ministry"
Lesson 5, "The Return of Christ, Part I"
Lesson 5, "The Return of Christ, Part 2"
Audio 1: "The Day of the Lord, Defined"
Audio 2: "The Day of the Lord, PreMillennial View"
Lesson 6, "Basic Christian Living"
Audio 1: "Basic Christian Living, Part 1"
Audio 2: "Basic Christian Living, Part 2"
Lesson 8, "The Lawless One"
Lesson 9, "Final Words of Encouragement"
"Paul Prays for the Colossians"
"The Speech of The New Man"
"The Acts of the Apostles"
Lesson 1 "The Church is Born"
"The Man with the Face of an Angel"
"The Gospel Goes to the Gentiles"
Carolyn Hennington has available many "hand stitched" scriptural and cultural fine silk prints, tapestries and needle arts supplied by a nonprofit charitable organization called The Widow's Friend, a program of Friends of Bangladesh/USA that serves widowed and destitute women in Bangladesh - "the poorest of the poor". For your "tax deductible" purchase contact Carolyn @ 601-835-7436.